I joined a new group swap that is going on on Flickr. I know I am about 8 months along and I do not need to be adding anything else to my plate, that's what I thought too. The group really pulled me in since they are making a pillow! A pillow is one of the first things my mom taught me how to make when I was a little girl and I made tons of them. I couldn't pass this one up especially since it will really be something that I will use. I need some new pillows for my couch or for my bedroom. Here is the Mosiac that I made to help my partner figure out what I like. My partner can make a pillow for me: greens (tv room for my couch) and blues (for my bedroom). Really can't go wrong with greens. Or my daughters room is the bright fun room. Owls, Trees (she has the pottery barn "brooke" bedding, or something fun for kids. Colors: Aqua, Pink, Yellow & Green. OR surprise me and I will find a place for it maybe for some future room?? I can't wait to get a pillow and to make one. In other news.....I finished the top of the baby quilt that I am making. Here is alittle taste. I would have it done by now but when I went earlier this week to buy the batting JoAnn's was all out of the one I wanted so they told me to come back on Friday and they should have it. I am hoping they do since I really want this WIP to be done. I especially want to be able to hang it over the crib and stare at it for awhile before the baby comes. That quilt is gorgeous! LOVE the colors and design. I'm 7mo along myself and I think it's the nesting. Because I find myself making plans and sewing like a mad woman! Oh what a fun swap, and she will have no trouble seeing what you like. Wow, I really love your quilt top! It is amazing! I LOVE the baby quilt. Serious eye candy. 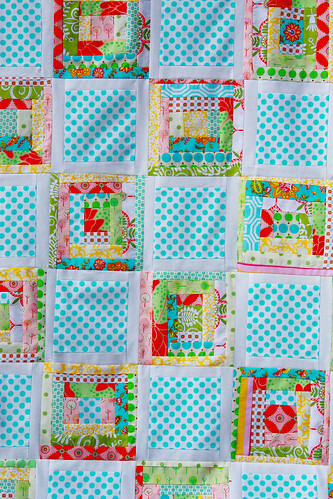 LOVE LOVE LOVE your quilt! I wish I had started quilting when my daughter was born....just think of all the beautiful things I could have made! Your fabric is absolutely gorgeous! I really like how the aqua spot on white pops! It's a terrific quilt. Your swap partner has plenty of inspiration there. Enjoy! Thank you, I love your work. I love the colours on your blocks, are they from Moda? Or where do you get the fabrics? I love that wonkiness of the block. It almost looks like a large flying geese at the top of it. Very very colourfull to say the least. 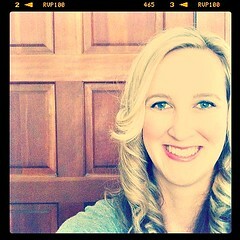 Again, a great blog to view! i wanted to join...i really did. i can't wait to see what you all come up with. love the quilt too! 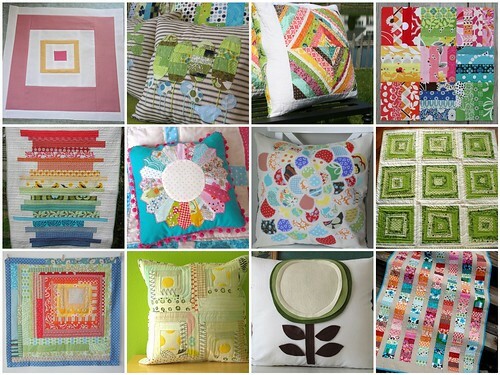 What fun for a pillow swap! And I love the choices you made to show your tastes! The baby quilt looks wonderful!